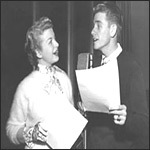 One of the most popular radio teenage comedies of the 1940's, A Date with Judy was (as Judy herself might have put it) "just sen-sash!" With a breathless, giggly tone and sentences punctuated with slang phrases, Louise Erickson was perfect as the teenager whose only serious concerns in life were boys, school, boys, hairstyles, boys, makeup, boys, her social standing...and boys. John Brown and Myra Marsh are heard as Judy's parents, and Dix Davis plays her younger brother, Randolph. Laugh with Judy and her friends Gloria, Mitzi, Stinky, Jo-Jo...and her steady boyfriend Oogie Pringle (played by Richard Crenna).